usiness Driven Test Management (BDTM) This book offers business and IT managers insight into the possibilities of exerting increased business control of the test process: Business Driven Test Management (BDTM). The concept of BDTM prioritises the result and gives the client of the test process (whether a business or IT manager) the ability to manage the risk coverage, lead time and cost of the test process in both the planning and the execution phases. The book also contains an introduction to and summary of the TMap NEXT Test Management Approach. TMap is the industry standard for testing that can be summarised in four essential principles: * Business Driven Test Management allows the client to manage testing on the basis of business considerations. * A full description of the test process, from test management to test specification & execution. * A complete 'toolbox' of technique descriptions and organisational & infrastructure support. * The method is adaptive, making it suitable for use in a range of situations and environments (new development, maintenance, waterfall / iterative / agile, custom-made / off-the-shelf software, outsourcing / offshoring). Over the years, TMap has evolved into the de facto standard for testing information systems. 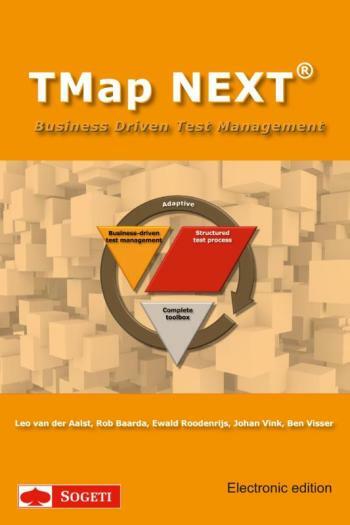 In 2006 it was updated as TMap NEXT, incorporating user experience and feedback and many practical examples, making it a highly valuable tool for current and future challenges in the field of testing. TMap NEXT is currently used in hundreds of companies and institutions in a broad range of sectors, including financial services, telecoms, government, utilities and aerospace. In addition to a summary of the methodology, this book features a detailed description of Business Driven Test Management and is therefore ideal for test managers who want to improve the quality of testing in their organisations.